In the month in which we find moments for remembrance, this photograph shows part of the World War 1 cemetery called ‘Tyne Cot’, on the Ypres Salient, near Passchendaele in Flanders. Its strange name is said to come from the fact that the Northumberland Fusiliers thought the German pill boxes looked like typical Tyneside workers cottages. The experience of visiting this place is overwhelming. 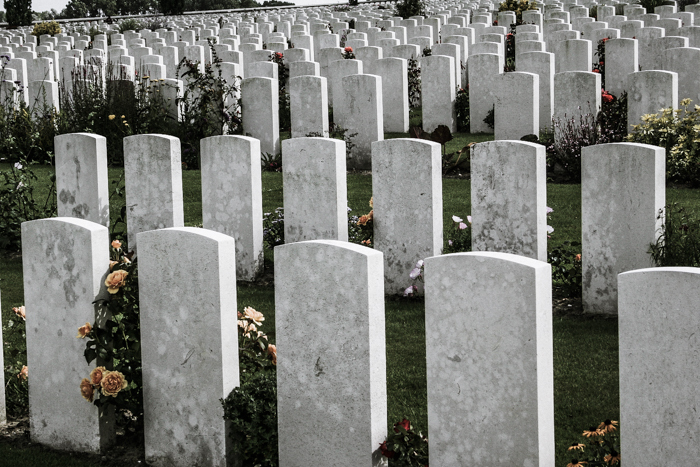 11,965 British and allied soldiers lie here; 8,369 of the graves are unnamed. The sheer numbers and scale are hard to take in. The tops of the stones form a sea of pale grey, which follows the undulations of the hillside into the far distance. I would not be the first to have thought how incongruous is the peacefulness of this place, now, in the context of what took place here 100 years ago.